“Today and here business formally assumes the obligations of a profession, which means responsible action as a group, devotion to its own ideals, the creation of its own codes, the capacity for its honors, and the responsibility for its own discipline, the awards of its own service.” (Page 36: The MBA Oath). Today, Mr. Young’s vision is finally being realized by The MBA Oath: Setting a Higher Standard for Business Leaders. Written by Max Anderson and Peter Escher, both Harvard MBA’s, The MBA Oath lays out the case for an ethical cannon in which business leaders should adhere. It’s well written, jammed packed with facts and make a compelling case that the future of business is clearly centered around ethical behavior and looking out for the common good (as opposed to maximizing shareholder wealth). The critics of The MBA Oath gravitate around this movement as just a big PR campaign to do some sort of damage control for the horrible reputation business leaders have in the 2008 crater that was the economy. What these critics fail to realize is that words to matter. Professions that have an ethical cannon are generally more ethical. They self regulate themselves and scorn from the community is a huge driver for compliance. These professions (doctors, lawyers, engineers and scientists) are not perfect but they have aspirations for perfection based on their common agreement to adhere to common goals, ethics and conduct. One thing to realize is that society grants business the ability to create special entities that garner rights. These rights allow business people to practice their art by giving a common framework for resolving disputes and the ability to enter into contracts. Without this framework, business would stall and sputter. These special rights have an implied condition that the business person not abuse these privileges. This is why The MBA Oath is such an important cannon — it spells out how MBA’s will be held accountable. 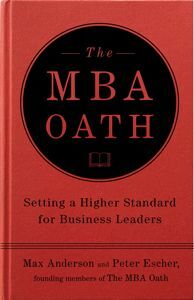 Mr. Anderson and Mr. Escher do an excellent job in laying out solid arguments for why The MBA Oath is required. These arguments are framed via the case method, which has a long history at Harvard and is the primary framework for how they teach. These cases illustrate how an ethical cannon really does change behavior and how leaders with an ethical compass make rational, reasonable and profitable decisions that also are for the common good. Interestedly, the authors also criticize the method because it only goes so far in developing a leader. Sometimes, the wealth of experience a professor has adds more than just the experiences of the students. This realization is refreshing and adds to the credibility of the book and the authors. If you run a business, thinking of starting a business or manage people, you need to read The MBA Oath. It’s a great first start in making the practice of management a profession. I also encourage every MBA to join me and take The MBA Oath. Click on this link for details. Check out this link if you want to read reviews and find places you can purchase the book.